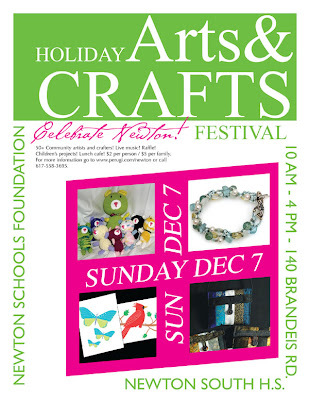 This Sunday December 7th is the seventh annual Celebrate Newton juried craft show from 10 AM- 4 PM at the Newton South High School. The show includes over 50 artists and crafters who will be selling wonderful selections of fine art, wearables, pottery & glass, jewelry, and other great crafts. There will also be live music, a lunch cafe, and raffle. THE HOLE THING will be selling their felted wool clothing and housewares and accessories for the 2nd year. Join us for this holiday shopping extravaganza and buy handmade!